Basehor-Linwood, the only undefeated team in the classification, looks to have the edge over Ottawa in terms of like opponents. The Bobcats earned a convincing 50-12 win over Spring Hill in Week 2 and topped De Soto 21-14 last week. The Cyclones, meanwhile, fell 28-27 to De Soto in their season opener and lost 33-12 to Spring Hill in Week 5. Basehor-Linwood has displayed an explosive offense, scoring at least 42 points in each of their first nine games and a season-high of 82 against Bishop Ward. However, the point totals have dipped in the playoffs, beating Tonganoxie 27-12 and scoring three touchdowns in the win over De Soto. Directed by coach Rod Stallbaumer, the Bobcats won the Kaw Valley League. Basehor-Linwood has a 23-8 record in three seasons with Stallbaumer as head coach. Senior quarterback Justin Phillips leads the Bobcat offense, passing for 1524 yards with 17 touchdowns and only three interceptions. Senior running back Chas Rollo runs for more than 8 yards per carry, totaling 1,254 yards and 17 touchdowns on the season. Eric Scott and Jackson Brimblecom have 34 and 30 receptions, respectively. Junior T.J. Williams paces the Basehor-Linwood defense with 72 tackles, including 16 for loss. Sophomore Nolan Ford has five sacks. Ottawa earned decisive victories over the Southeast Kansas League’s Fort Scott and Labette County the last two weeks. Combined, the Cyclones won the two playoff games 92-13. Devion Bethea rushed for 219 yards and two touchdowns during the win over Labette County. Quarterback Isaac McCullough threw for three touchdowns. Coach Rob Hedrick has directed Ottawa to a winning season for the third year in a row. The Cyclones have qualified for the playoffs in three of the past four seasons after going through a 9-year drought prior to Hedrick taking over as head coach. Mulvane has enjoyed a three-win improvement, while Buhler has capably replaced a large senior class with another fine year. Mulvane ranks third in offense with 45.2 points per contest and allows 24. Buhler has an average score of 36-20. The Wildcats have won its most games since 2012. Buhler has at least nine wins in the last four and eight of the past nine. The teams have six common opponents, specifically Maize South, Andale and Collegiate. Buhler lost to Collegiate, 45-21, defeated Maize South 21-14 and beat Andale, 28-21. Mulvane lost to Andale, 61-52, and fell to Maize South, 38-35, but rolled over Collegiate, 35-7. Standout junior quarterback Jayden Price leads the offense. Last week, he led the Wildcats to an early 28-0 lead and eventual 42-7 victory over Augusta. Mulvane collected 55 plays for 319 yards. Price finished 14 of 18 for 180 yards and four scores and rushed for 83 yards. Senior running back Keaton Shoemaker has had a strong season, while seniors Dalton Blaine and Chase Myears are key players at wide receiver. Mulvane averages more than 420 yards per contest. Senior defensive back Zach Helbing had a fumble recovery and scored for his six non-offensive touchdowns of the season. Quarterback Ethan White runs the Buhler offense, while Jack Goertzen and Dalton Brown lead the Crusader ground game. Last week, Buhler scored the first 45 points en route to a 45-13 win against Abilene. Brown had 198 rushing yards and three touchdowns. 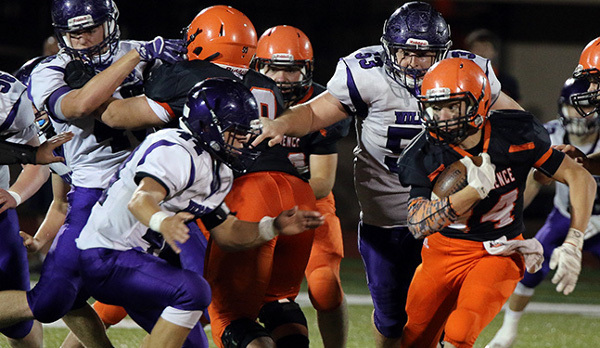 The Crusader defense forced Abilene to punt six times. The Crusaders have made the quarterfinals every year since 2007 and are 4-4 in quarterfinal contests. These teams have matched up 14 times since 2004, including two years with two games. In 2012, Mulvane won 38-34 in the regular season and then 15-0 in the playoffs. Last year, Buhler captured a 20-14 win in the regular season and then 35-28 in the playoffs. Buhler holds an 8-6 edge in those matchups, but has won the last four. A major key will be the passing game for Mulvane. Against Buhler, Collegiate threw for 343 yards. The Spartans threw for 140 passing yards against Mulvane.